Will Birmingham join the NBA G League? 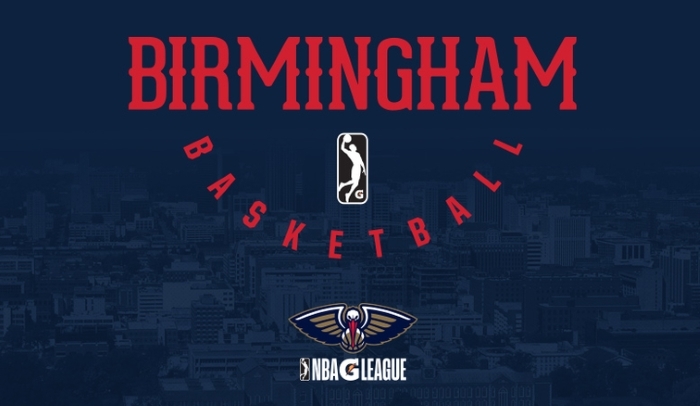 Multiple media outlets are reporting that a National Basketball Association team, the New Orleans Pelicans, will soon announce they will be placing an NBA G League team in Birmingham. Currently, all but three NBA teams have affiliate teams in the G League; New Orleans, the Denver Nuggets, and the Portland Trail Blazers. The NBA G League, typically called the G League, is the official minor league of the NBA. The league was created to allow players, coaches, officials, and front office staff to work their way up to the NBA. The league began play in the 2001-02 season as the National Basketball Development League, with the original eight franchises located in the southeast (Alabama, Georgia, North Carolina, South Carolina, and Virginia). Beginning with the 2005-06 season, the NBDL was renamed the NBA Development League, or the NBA D-League, as part of a new collective bargaining agreement with the NBA and a bid to appeal to more fans by showing their connection to the major league. By 2015, the last multiple-affiliate team, the Fort Wayne Mad Ants, was purchased by the Indiana Pacers leading to the first season where all D-League teams were affiliated with only one NBA team. As there were no longer any unaffiliated D-League teams left, the remaining NBA teams began purchasing expansion franchises or hybrid partnership teams and placing them near the parent team. Before the 2017-18 season, the D-League entered into a multi-year partnership with Gatorade to became the title sponsor of the D-League, and the league was renamed the NBA Gatorade League, or NBA G League for short. Starting with the 2019–20 season, the G League will begin to offer Select Contracts to players that are not yet eligible to enter the NBA draft. Since 2006, players that aren't at least 19 years old by the end of the calendar year have been ineligible, creating what became known as the "one-and-done" rule where players joined a college basketball team for one season and then left for the NBA. The new Select Contract is to be an alternative for players who do not want, or cannot, attend a college and is worth up to $125,000 for a season. Along with Birmingham, the Pelicans have been in discussions with Baton Rouge, Shreveport, Jackson (MS), Mobile, Pensacola. The other cities have been dropped over time for varying reasons. It is anticipated the team will eventually play in the Birmingham-Jefferson Convention Complex's Legacy Arena. However, the city already had plans in place for a $125 million renovation of the arena. Outside, the plans include aesthetic enhancements such as a new facade, new entrances, and a new design of the piazza for a more open plan that provides better pedestrian flow between the arena, concert hall, and theater. Inside, the renovation will add a suite level, premium club space, and enhancements to improve crowd flow. With the construction going on, the new team could not play in Legacy Arena until the 2020-21 season. The Pelicans are expected to announce that the team will play one year in Erie, Pennsylvania before moving to Birmingham. The Erie BayHawks have been in the league since the 2008-09 season. In 2016, the Orlando Magic purchased the BayHawks with the intention of moving the team to Lakeland (FL) for the 2017-18 season. The Atlanta Hawks had planned to start a new G League team in College Park (GA) for the 2019-20 season but the BayHawks original owners petitioned the Hawks to activate their franchise a year early and play in Erie for a year. After this season, the Hawks will move their team, leaving Erie without a G League franchise. With the Pelicans needing an arena for one season, Erie would seem to be an excellent choice as a temporary home for the Birmingham team. As part of the $300 million plan, a new open-air stadium will be built near the BJCC, with UAB football as a main tenant. Once built, other teams could possibly play in the stadium, such as the Alliance of American Football's Birmingham Iron and the United Soccer League's Birmingham Legion. Both of those teams are set to begin play in 2019. The G League schedule runs from November to March and teams typically play around 25 home games. At a press conference in Birmingham, the New Orleans Pelicans formally announce they will place an NBA G League team in the city. While renovations take place at the Legacy Arena, the team will begin play as the Erie BayHawks and could move to Birmingham as early as the 2020-21 season. If the upgrades take longer than expected, the team will remain in Erie for another year before moving here. No team name was announced but the Birmingham community will be involved in the process of selecting the nickname. “We’ll start having some fun in naming the team, (by) engaging the fans. And do some other fun marketing things in Birmingham, over the next two years,” New Orleans Pelicans president Dennis Lauscha said. Lauscha noted that based on metrics used by the G League to determine the strength of markets, Birmingham received high marks, in areas such as the demographics of sports fans and TV market size. In addition, the city is in close proximity to New Orleans, allowing players and team personnel to easily shuttle between the two locations. “Having the players feel like they’re still connected to the team while they’re on assignment is very important,” Pelicans general manager Dell Demps said. Demps was also an assistant coach and GM in the G League. The Pelicans were established in 2002 as the New Orleans Hornets when owner Charlotte Hornets owner George Shinn moved his franchise. Due to the damage caused by Hurricane Katrina in 2005, the franchise temporarily relocated to Oklahoma City, where they spent two seasons officially known as the New Orleans/Oklahoma City Hornets. The team returned to New Orleans full-time for the 2007–08 season. In December of 2010, the NBA purchased the Hornets from Shinn for an estimated $300 million. On April 13, 2012, it was announced that Tom Benson, owner of the National Football League's New Orleans Saints, had purchased the franchise from the NBA for $338 million. Upholding Tom Benson's statement that the team would soon be renamed to better reflect the region, the franchise would become the New Orleans Pelicans after the 2012-13 season. 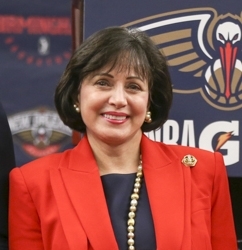 On March 15, 2018, Tom Benson died from flu complications and ownership of the Pelicans and the Saints were transferred to Benson's widow, Gayle Benson. The NBA G League is a proven developer of talent. A record 40% of NBA players to start the 2018-19 season had NBA G League experience, while 33 players selected in the 2017 NBA Draft played in the NBA G League last season.